Sahara Group’s Executive Director, Temitope Shonubi has advised millennials seeking leadership roles to be innovative and defy myths and misconceptions. 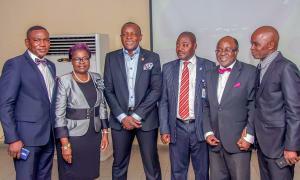 LAGOS, LAGOS, NIGERIA, March 5, 2019 /EINPresswire.com/ -- Sahara Group’s Executive Director, Temitope Shonubi has advised millennials seeking leadership roles to embrace challenges and break new grounds through innovation, collaboration and an insatiable desire to defy myths and misconceptions. Speaking to Law students on “The Future of the Workplace: Millennials in Leadership” at Lead City University, Ibadan, Shonubi said while it was imperative for businesses to give millennials more opportunities, “leadership roles usually gravitate towards capable, committed, irrepressible, creative and exceptional individuals”. A recent study by the Financial Times indicates that over the next few years, the younger generations will grow from 35 per cent to account for 75 per cent of the global workforce demography, while the older generations in the work place will shrink considerably from 65 per cent to 25 per cent by 2025. Millennials already make up a large portion of today’s working population. “As their numbers grow and they gain more experience, millennials will take a larger role in company leadership, and specifically in organizational transformation efforts. The onus is on millennials to embark on continuous self-development with a mind-set that is never satisfied with the norm. There has to be a new way to make things better; finding that way is the attribute that will set you apart,” Shonubi stated. He urged the students to be fearless, patient, avoid substance abuse and be willing to give back to the society to promote sustainable development across the globe. Sahara Group, a leading energy conglomerate with operations in over 38 countries has special leadership programmes that are designed to provide direction and guidance for the company’s young professionals. These include the Sahara Talent and Entrepreneurship program (STEP) and the Graduate Engineering Program (YEP) that recently brought on board over 30 young graduate engineers into the power sector. Sahara also encourages a healthy work-life balance through staff engagement and team bonding activities such as the Saharalympics - a bi-annual company-wide sports event; Variety Night which provides a platform for staff to showcase talents and its flagship annual End of year party which epitomises Sahara’s ‘work-hard play-hard’ culture, among others.